Political philosophy is a branch of philosophy, which studies fundamental questions concerning the social or communal life of human beings. It inquires into a broad range of questions, such as the principles of justification of power and social governance, the grounds for the justification of certain forms of government, social obligations of constituting members of a society, and the origin, nature, and purpose of government. Interlaced concepts examined include freedom, control, liberty, suppression, censorship, liberty, rights, property, utopia, human natures, war, peace, justice, and others. While political science focuses on existing or possible theories and practices of social, political matters, political philosophy focuses on the normative aspects of political theories and practices. These disciplines had not been clearly defined until recently, and just as classical political theorists dealt with both normative and descriptive issues, political theorists today continue to discuss both. Since political philosophy deals with both spiritual and material aspects of social life, it is intertwined with other branches of philosophy including Ethics, philosophy of law, philosophy of economics, and other fields of study such as sociology, sociology of knowledge, economics, anthropology, religion, aesthetics, theories of human natures, critique of cultures, and even metaphysics in some cases. The distinction of political philosophy from political science is not easy for two reasons. First, historically descriptive and empirical studies of political affairs, which fall under political science, and critical, normative studies of the principles and concepts of politics, which generally fall under political philosophy, were not separated. Political theorists developed political theories based upon arguments for normative justification and certain value perspectives. Second, unlike sciences of material objects such as physics and chemistry, all principles and descriptions necessarily involve a high degree of interpretation. Interpretation presuppose a framework of interpretation, which necessarily includes value perspectives. Accordingly, a sharp separation between description and prescription, between fact and value is difficult due to the nature of human existence, which is hermetical by nature. Thus, the distinction between political philosophy and political science remains unclear. As an academic discipline, Western political philosophy has its origins in ancient Greek society, when city-states were experimenting with various forms of political organization including monarchy, tyranny, aristocracy, oligarchy, and democracy. One of the first, extremely important classical works of political philosophy is Plato's The Republic, which was followed by Aristotle's Politics. Roman political philosophy was influenced by the Stoics, and the Roman statesman Cicero wrote on political philosophy. Independently, Confucius, Mencius, Mozi, and the Legalist school in China, and the Laws of Manu and Chanakya and in India, all sought to find means of restoring political unity and stability; in the case of the former three through the cultivation of virtue, in the last by imposition of discipline. In India, Chanakya, in his Arthashastra, developed a viewpoint which resembles the Legalists and anticipates Niccolò Machiavelli. Ancient Chinese and Indian civilization resembled that of Ancient Greece in that there was a unified culture divided into rival states. In the case of China, philosophers found themselves obliged to confront social and political breakdown, and seek solutions to the crisis that confronted their entire civilization. The rise of Islam strongly altered the power balances and perceptions of origin of power in the Mediterranean region. Early Muslim philosophy emphasized an inexorable link between science and religion, and the process of ijtihad to find truth—in effect all philosophy was "political" as it had real implications for governance. This view was challenged by the Mutazilite philosophers, who held a more Greek view and were supported by secular aristocracy who sought freedom of action independent of the religious institutions. By the medieval period, however, the Asharite view of Islam had in general triumphed. Islamic political philosophy, was, indeed, rooted in the very sources of Islam, i.e. the Qur'an and the Sunnah, the words and practices of Muhammad, and much of its development is attributed to the great philosophers of Islam: al-Kindi (Alkindus), al-Farabi (Abunaser), İbn Sina (Avicenna), Ibn Bajjah (Avempace), Ibn Rushd (Averroes), and Ibn Khaldun. The political conceptions of Islam such as kudrah, sultan, ummah, cemaa—and even the "core" terms of the Qur'an, i.e. ibada, din, rab and ilah- are taken as the basis of an analysis. Hence, not only the ideas of the Muslim political philosophers but also many other jurists and ulama posed political ideas and theories. For example, the ideas of the Khawarij in the very early years of Islamic history on Khilafa and Ummah, or that of Shia Islam on the concept of Imamah are considered proofs of political thought. The clashes between the Ehl-i Sunna and Shia in the seventh and eighth centuries had a genuine political character. The fourteenth century Arab scholar Ibn Khaldun is considered one of the greatest political theorists. The British philosopher-anthropologist Ernest Gellner considered Ibn Khaldun's definition of government, "an institution which prevents injustice other than such as it commits itself," the best in the history of political theory. Muslim political philosophy did not cease in the classical period. Despite the fluctuations in its original character during the medieval period, it has continued to last even in the modern era. Medieval political philosophy in Europe was heavily influenced by Christian thinking. It had much in common with the Islamic thinking in that the Roman Catholics also formulated their philosophies within a theological context. Perhaps the most influential political philosopher of the medieval period was St. Thomas Aquinas who helped reintroduce Aristotle's works, which had been preserved by the Muslims, along with the commentaries by Averroes. Aquinas's use of them set the agenda for scholastic political philosophy, and dominated European thought for centuries. During the Renaissance, secular political philosophy began to emerge after about a century of theological political thought in Europe. While the Middle Ages did see secular politics in practice under the rule of the Holy Roman Empire, the academic field was wholly scholastic and therefore Christian in nature. One of the most influential works during this burgeoning period was Niccolò Machiavelli's The Prince, written between 1511-1512 and published in 1532, after Machiavelli's death. That work, as well as The Discourses, a rigorous analysis of the classical period, did much to influence modern political thought in the West. Though the work was written for the di Medici family in order to perhaps influence them to free him from exile, Machiavelli supported the Republic of Florence rather than the oligarchy of the di Medici family. At any rate, Machiavelli presents a pragmatic and somewhat consequentialist view of politics, whereby good and evil are mere means used to bring about an end, i.e. the secure and powerful state. Thomas Hobbes, one of the first social-contract philosophers, famous for his dismal and pessimistic view of human life, went on to expand this view at the start of the seveteenth century during the English Renaissance. 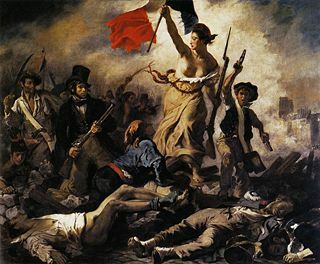 Eugene Delacroix's Liberty Leading the People (1830, Louvre), a painting created at a time where old and modern political philosophies came into violent conflict. During the Enlightenment period, new theories concerning the human conditions, the discovery of other societies in the Americas, and the changing needs of political societies led to new questions and insights by such thinkers as Jean-Jacques Rousseau, Montesquieu, and John Locke. Many of these philosophers are considered social-contract philosophers, who inquired into the basic nature of man, or man in his natural state, and the reason for, and best model of, political and social organization. They explored issues such as property rights, the role of the individual within the whole state, and the role of state in the lives of individual citizens. Some of these theorists, like Locke, provided groundbreaking ideas that would contribute to the vision of a free and liberal society, as was reflected in the social and political upheavals in the subsequent centuries, such as the American Revolution. Karl Marx and his theory of Communism developed along with Friedrich Engels proved to be one of the most influential political ideologies of the twentieth century. The industrial revolution produced a parallel revolution in political thought. Urbanization and capitalism greatly reshaped society. During this same period, the socialist movement began to form. In the mid-nineteenth century, Marxism was developed, and socialism in general gained increasing popular support, mostly from the urban working class. By the late nineteenth century, socialism and trade unions were established members of the political landscape. In addition, the various branches of anarchism and syndicalism also gained some popularity. In the Anglo-American world, anti-imperialism and pluralism began to draw attention at the turn of the century. The onset of World War I proved to be a crucial turning point in the development of political societies. The Russian Revolution of 1917 (and similar, albeit less successful, revolutions in many other European countries) brought communism—and in particular the political theory of Marxism-Leninism—on the world stage. At the same time, social democratic parties won elections and formed governments for the first time, often as a result of the introduction of universal suffrage. In response to the sweeping social changes that occurred in the years after the war, ultra-reactionary ideologies such as fascism began to take shape. In particular, the rise of the Nazis in Germany would later lead to the Second World War. All political thought was deeply affected by the Great Depression, which led many theorists to reconsider the ideas they had previously held as axiomatic. In the United States, President Franklin D. Roosevelt introduced the New Deal. In Europe, both the extreme left and the extreme right gained increasing popularity. After World War II, analytic philosophers expressed skepticism about the possibility that normative judgments had cognitive content, and political science turned toward statistical methods and behavioralism. The 1950s saw pronouncements of the 'death' of the discipline, followed by debates about that thesis. A handful of continental European emigres to Britain and the United States—including Hannah Arendt, Karl Popper, Friedrich Hayek, Leo Strauss, Isaiah Berlin, Eric Voegelin and Judith Shklar—encouraged continued study in the field. In general, there was a marked trend towards a pragmatic approach to political issues, rather than a philosophical one. Much academic debate regarded one or both of two pragmatic topics: how (or whether) to apply utilitarianism to problems of political policy, or how (or whether) to apply economic models (such as rational choice theory) to political issues. Communism remained an important focus especially during the 1950s and 1960s, as well as Zionism, racism, and colonialism. In addition, the rise of feminism, the end of colonial rule, and newly gained rights by minorities, such as African Americans, in the developed world led to a rise in feminist, postcolonial, and multicultural thought. In 1971, John Rawls published his work A Theory of Justice. Rawls used a thought experiment, the original position, in which he explores principles of justice for the basic structure of society, while offering a criticism of utilitarian approaches to questions of political justice. Robert Nozick's book Anarchy, State, and Utopia (1974) responded to Rawls from a libertarian perspective. In Europe, several new lines of philosophy directed at critique of existing societies arose between the 1950s and 1980s. Many of these took elements of Marxist economic analysis, but combined them with a more cultural or ideological emphasis. Out of the Frankfurt School, thinkers like Herbert Marcuse, Theodor W. Adorno, Max Horkheimer, and Jürgen Habermas combined Marxian and Freudian perspectives. Along somewhat different lines, a number of other continental thinkers—still largely influenced by Marxism—put new emphases on structuralism and on a "return to Hegel." Along the (post-) structuralist line (though mostly not taking that label) are thinkers such as Gilles Deleuze, Michel Foucault, Claude Lefort, and Jean Baudrillard. The Situationists were more influenced by Hegel; Guy Debord, in particular, moved a Marxist analysis of commodity fetishism to the realm of consumption, and looked at the relation between consumerism and dominant ideology formation. Another debate developed around the (distinct) criticisms of liberal political theory made by Michael Sandel and Charles Taylor. The liberalism-communitarianism debate is often considered valuable for generating a new set of philosophical problems. Today, some debates regarding punishment and law center on the question of natural law and the degree to which human constraints on action are determined by nature, as revealed by science in particular. Other debates focus on questions of cultural and gender identity as central to politics. While this list is not a comprehensive list of all political philosophers, listed below are a few of the most canonical or important thinkers, and especially philosophers whose central focus was in political philosophy and/or who are good representatives of a particular school of thought. Confucius : The first thinker to relate ethics to the political order. Chanakya : Founder of an independent political thought in India, laid down rules and guidelines for social, law and political order in society. Mozi : Eponymous founder of the Mohist school, advocated a strict utilitarianism. 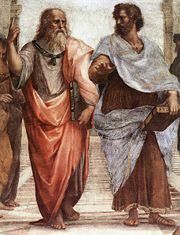 Socrates/Plato: Socrates is widely considered founder of Western political philosophy, via his spoken influence on Athenian contemporaries; since Socrates never wrote anything, much of what we know about him and his teachings comes through his most famous student, Plato. Plato's The Republic is a work that explores political philosophy, ethics, and metaphysics. Niccolò Machiavelli: First systematic analyses of: (1) how consent of a populace is negotiated between and among rulers rather than simply a naturalistic (or theological) given of the structure of society; (2) precursor to the concept of ideology in articulating the structure of commands and law. Thomas Hobbes: One of the first who articulated how the concept of a social contract that justifies the actions of rulers (even where they are contrary to the individual desires of governed citizens), can be reconciled with a conception of sovereignty. Baruch Spinoza: Asserted the free development of the rationality of individuals, and a more liberal, humanistic view of state. Baron de Montesquieu: Analyzed protection of liberty by a "balance of powers" in the divisions of a state. Edmund Burke: Burke was a forerunner of conservative thought. His Reflections on the Revolution in France is the most popular of his writings where he denounced the French Revolution. John Adams: Enlightenment writer who defended the American cause for independence. Adams is known for his outspoken commentary in favor of the American revolution. 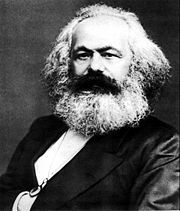 Karl Marx: In large part, added the historical dimension to an understanding of society, culture and economics. Created the concept of ideology in the sense of (true or false) beliefs that shape and control social actions. Analyzed the fundamental nature of class as a mechanism of governance and social interaction and his philosophy laid the groundwork for Marxism-Leninism, and later communism. John Rawls: Revitalised the study of normative political philosophy in Anglo-American universities with his 1971 book A Theory of Justice, which uses a version of social contract theory to answer fundamental questions about justice and to criticise utilitarianism. Robert Nozick: Criticized Rawls, and argued for Libertarianism, by appeal to a hypothetical history of the state and the real history of property. F.A. Hayek: criticised socialism and restated the classical liberal position. Some notable contemporary political philosophers are Amy Gutmann, Seyla Benhabib, George Kateb, Wendy Brown, Stephen Macedo, Martha Nussbaum, Thomas Pogge. Strauss, Leo, and Joseph Cropsey. History of Political Philosophy. Chicago: Rand McNally, 1963. London Philosophy Study Guide – offers many suggestions on what to read, depending on the student's familiarity with the subject of political philosophy. This page was last modified on 30 March 2019, at 20:26.